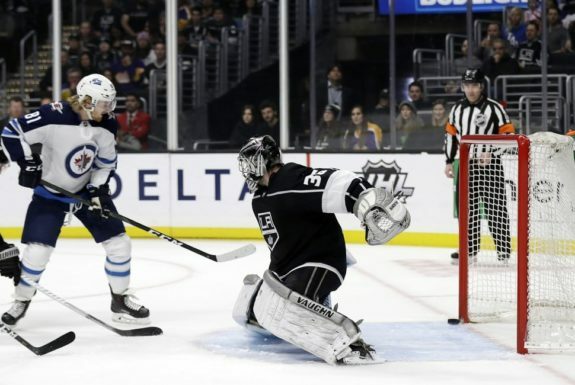 LOS ANGELES — Kyle Connor had a goal and an assist, leading the Winnipeg Jets to a 3-2 win over the Los Angeles Kings on Monday night. Kevin Hayes and Tyler Myers also scored for the Jets, who have a three-point lead over Nashville atop the Central Division. Laurent Brossoit made 15 saves. Sean Walker and Dustin Brown had the goals for the Kings. Jack Campbell stopped 25 shots. Los Angeles, which has dropped six of seven and 15 of 18, was eliminated from playoff contention with the loss. At 58 points, the Kings are last in the Western Conference and have the second-fewest points in the NHL. Winnipeg took the lead with two goals 65 seconds apart on rebounds. Hayes scored his 17th of the season at 11:32 of the first period when he put in the rebound of Connor’s wraparound. The Jets added to their lead on the power play when Connor was able to put home his second attempt in front after his first shot hit the right post. He has 28 goals, 11 on the power play. Los Angeles then rallied by scoring the next two. It got on the board at 14:55 when Walker let loose a slap shot and beat Brossoit top shelf and just inside the left post for his third. Brown tied it at 10:21 of the second with a wrist shot from the left circle on the power play. It was Brown’s 19th goal and his team-leading eighth on the power play. It also was his third goal in the past four games. Winnipeg regained the lead at 16:50 of the second when Myers went the length of the ice on an odd-man rush and beat Campbell on his glove side for his ninth. NOTES: Kings D Drew Doughty played in his 400th consecutive game, extending his franchise record. It is also the fifth-longest active streak in the NHL. Doughty, who leads the team in assists, got the first assist on Brown’s goal for his 36th of the season. … Winnipeg is 4 for 11 on the power play in its last four road games. … F Matt Hendricks made his first appearance for the Jets this season after being acquired from Minnesota at the trade deadline. Hendricks, who played for Winnipeg last season, was on the fourth line. Jets: Continue their three-game road trip Wednesday at Anaheim. Kings: Host the San Jose Sharks on Thursday.